The Acklam Green Centre has hosted its first Dementia Friendly film screening for people living with Dementia, and their friends, family and carers. 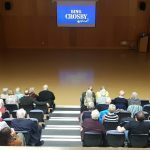 A pilot dementia-friendly film screening of High Society took place in the centre’s large conference hall on Valentine’s Day for 38 people from the local community. The event was organised in partnership with Brian Rowcroft, business engagement lead for Dementia Friendly Middlesbrough, a project that continues to develop Middlesbrough as a nationally recognised dementia friendly community. Dementia friendly screenings enable people living with dementia and their carers to enjoy a cinema experience in a safe and comfortable environment. Screenings are enhanced to suit the needs of people living with dementia; during the showing of High Society low lights were left on inside the conference hall and people were encouraged to express themselves freely during the film. The Acklam Green Centre business and community centre is recognised as a dementia-friendly venue and staff from the centre have recently become Dementia Friends, having participated in the Alzheimer’s Society’s programme which is designed to transform the way the nation thinks, acts and talks about dementia. The screening was organised to further highlight its commitment to supporting those with the condition in the local community, and to explore whether there was an appetite for more events being held at the centre.